That progress in data analytics for manufacturing applications, technologies and platforms means that manufacturers can gain greater visibility across their supply chains from the shop floor to the top floor of their companies. Manufacturing is among the most data-intensive industries there is. From recruiting, managing and improving supply chains to orchestrating customer orders across their production centers to delivering orders on time, manufacturing is, by nature, a very data-intensive process. Given the wealth of data inherent in manufacturing, there are many opportunities to improve production efficiency, flexibility and visibility based on the massive amount of data being generated in every manufacturing business. Combining semi-structured, unstructured and structured data into a common system of record that scales across an entire enterprise is what’s needed to excel in many manufacturing businesses, both now and in the future. 69 percent of decision-makers believe analytics will be crucial for business success in 2020. While more than 80 percent of manufacturers realize machine learning can enhance maintenance, less than 20 percent have instituted any productive maintenance capabilities. 46 percent of manufacturers agree that implementing and using data analytics is no longer optional. 32 percent see the potential for big data analytics and the Industrial Internet of Things (IIoT) to improve supply chain performance and increase revenue. Manufacturers perceive data analysis as a key component of a successful Industrial Internet of Things (IIoT) strategy across their operations. 92% of manufacturers say they are at parity or ahead of competitors on Digital Manufacturing. The proliferation of data in manufacturing creates many opportunities to improve operations through the use of analytics applications and platforms. The same technologies that form the foundation of business analytics in the manufacturing industry today are agile and flexible enough to excel in manufacturing. 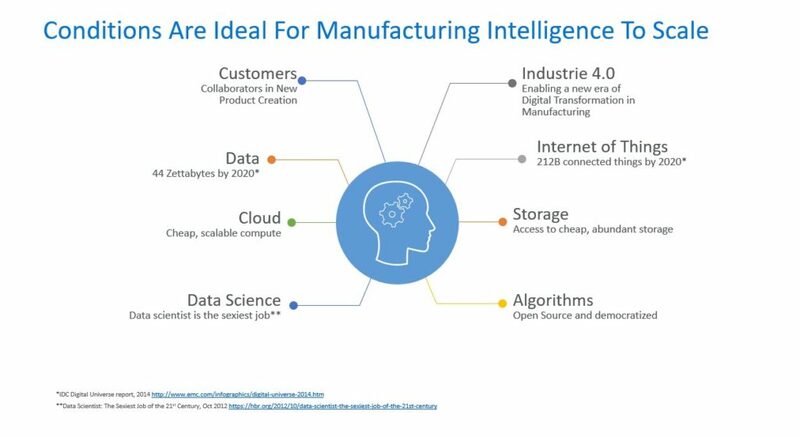 Manufacturing intelligence, by definition, is the ability of analytics platforms and applications to capture, aggregate, analyze and provide line-of-business users with accurate insights into their manufacturing operations. Scaling smoothly from descriptive to predictive, manufacturing analytics intelligence is designed to meet the information needs of a wide variety of roles across manufacturing operations. The scope and scale of manufacturing business analytics is based on the need to monitor machines and processes at a very detailed level. This helps users know when crucial maintenance and performance upgrades need to be scheduled. Machine monitoring includes monitoring, managing and predicting production cycle times. This includes how efficient a given production process is, in addition to tracking machine failures. Diagnostic uses of manufacturing analytics include creating new metrics and key performance indicators (KPIs) for tracking production capacity utilization. Users can track production costs and variances, as well as provide data to streamline failure analysis. Predictive and prescriptive manufacturing intelligence are the areas of greatest interest to manufacturers today. Gaining actionable insights into line and product team flexibility, determining predictive maintenance and optimizing production schedules using predictive and prescriptive analytics has the potential to revolutionize the manufacturing industry. The study Industrial Analytics Report 2016/17 from the Digital Analytics Association e.V. Germany (DAAG), in collaboration with research firm IoT Analytics GmbH took a look at data usage in the manufacturing industry. The report provides a wealth of insights regarding how business analytics applications are enabling greater industrial analytics and manufacturing intelligence software. Every manufacturer creates a data ecosystem every day it opens for business and produces products. The foundational elements of every manufacturer’s data ecosystem need to be managed to their specific strengths, with the contributions they can collectively make to greater business intelligence for manufacturing. The most prolific sources of data is often customers, especially when they’re collaborators in creating products thanks to the data generated from their transactions. Suppliers, the production process itself and Internet of Things (IoT) initiatives are now in production for potential use in manufacturing intelligence. Industrie 4.0 initiatives are becoming more prevalent globally, creating even more data. All these sources of data are converging, making the conditions ideal for manufacturing intelligence to scale in the next three years. Real-time integration and monitoring enable the analytical foundation of manufacturing intelligence software to scale from providing relatively simple descriptive analytics to more advanced predictive and prescriptive metrics and KPIs. Measures the time elapsed from when an order is first taken to when it’s produced and moved to finished goods inventory. Manufacturing cycle times improve when there’s real-time data integration to gain greater insights into overall production performance. Manufacturers are gaining greater insights from predictive and prescriptive modeling to see where there are constraints or roadblocks to improving cycle times. Using manufacturing intelligence-based dashboards and online reporting tools, it’s possible to see which processes and factors a manufacturing process is reliant on, as well as which are slowing down cycle times. Today, predictive modeling and machine learning are increasingly being adopted by globally-based manufacturers to further improve manufacturing cycle times. A must-have metric of any manufacturing operation, Overall Equipment Effectiveness (OEE) measures the overall performance of a given machine, product line or work center. It’s calculated using the formula of Availability * Performance * Quality, and is considered the most reliable metric for tracking production performance to the machine and plant floor level. Manufacturers often aggregate OEE metrics to the division or plant level. For example, an automotive OEM partnered with Tata Consultancy Services to improve their production processes that had seen Overall Equipment Effectiveness (OEE) of the press line reach a low of 65 percent, with the breakdown time ranging from 17 percent – 20 percent. Quantifies plant or product center performance, and has been constrained in the past by lack of real-time data and monitoring. With manufacturing intelligence applications and platforms based on business analytics-based technologies, it’s possible to streamline production workflows with greater insight, while also finding additional capacity. Defines how much salable product can be produced in a given period. The yield is invaluable in determining how the product, process and plant locations are performing versus the plan. With real-time integration in monitoring combined with predictive analytics for manufacturing, it’s possible to calculate a more precise analysis of yield variance. Yields are an indicator of how effective production planning and scheduling is, and how OEE levels of equipment are impacting overall throughput. Having real-time insights into yields can help optimize production runs and attain higher product quality goals. Each manufacturer creates their own specific perfect order index (POI) to measure how accurate they are in taking an order, defining production analytics and scheduling including inventory allocation and fulfilling the order on time. Perfect order performance is calculated using the following equation: (Percent of orders delivered on time) * (Percent of orders complete) * (Percent of orders damage free) * (Percent of orders with accurate documentation) * 100. The American Productivity and Quality Center (APQC) has determined by that the majority of manufacturers have a perfect order index level of 90 percent, leaving 10 percent of orders in an incomplete or failed state based on customer requirements. By combining order histories, customer purchase patterns, production scheduling, supply chain delivery and quality schedules, it’s possible to determine which factors most and least contribute to perfect order performance. Manufacturers in build-to-order and engineer-to-order manufacturing rely on perfect order performance to determine how well their customized manufacturing workflows are working daily. One manufacturer found that just a 3 percent improvement in perfect order performance led to a 12 percent increase in gross contribution margins. Defines how many products were returned by customers due to a quality problem or the products not meeting customer expectations. Today, many manufacturers are relying on Microsoft Excel spreadsheets to manage RMAs. With just a simple listing of RMA numbers, manufacturers lack the insight as to what led to a product being returned in the first place. By combining returns data and creating a more scalable database than just a spreadsheet, manufacturers can classify the factors of why an RMA was requested in the first place. Then they can complete a cause analysis of the problem. Manufacturing intelligence platforms, applications and tools are the key to gaining greater insights into why RMAs happen for a specific product. They also help guide users to what can be done to alleviate the factors causing customers to ask for refunds or credits. Manufacturing intelligence can create a single, unified system of record for all activity on a given product. In industries with stringent quality control requirements, having a system of record regarding all activity can save thousands of hours of work per year, and millions of dollars in lost revenue. An example of how manufacturing intelligence is used for compliance includes medical device manufacturers supporting their track and trace initiatives that keep them in compliance with ISO 13485, ISO9001, Current Good Manufacturing Practice (CGMP) and FDA 21 CFR Part 820. The essence of track and trace is determining the current and past location of a given part, assembly or component. Manufacturing intelligence is ideal for this requirement, and is proving to be very valuable in assisting medical device manufacturers today. Manufacturing intelligence is enabling a new era of manufacturing, one not constrained by a lack of real-time data or insights that was holding back previous generations of global manufacturing. By integrating enterprise-level systems and creating a unified system of record, manufacturing intelligence has the potential to revolutionize how products are produced, shipped, sold and serviced. There are many areas where manufacturing intelligence can bring greater business value too. Take, for example, creating a service-based business that captures sensor data, analyzes it and provides preventative maintenance recommendations for keeping machines up and running. GE Oil and Gas is doing this today across its drilling platform business, relying on manufacturing intelligence as the catalyst for their future revenue growth. How do you see business intelligence impacting your manufacturing operations? Have you implemented any of these processes yet? Let us know in the comments!